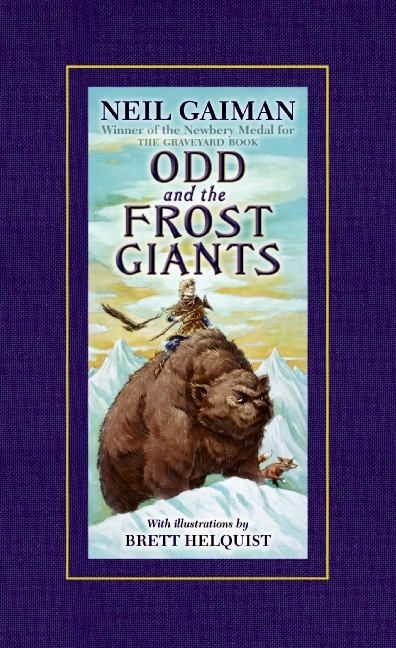 October's Children's Book Club selection was Odd and the Frost Giants by Neil Gaiman. This novel is based on the traditional Norse mythological gods Thor, Loki, and Odin, and their kingdom, Asgard. Gaiman creates a new twist to the classic tale by inserting a very human, very likable twelve-year old as the main protagonist of the story. Odd is an unlucky boy. His father has died, his mother has remarried an unkind man, and his village is in a perpetual state of winter. Odd decides to set off on his own, intending to leave behind all of the bickering that has ensued from the bad weather. What he ends up doing is befriending the famous gods who have been banished from Asgard. In the guise of a bear, a fox, and an eagle, the gods and their young human friend travel back to Asgard in order to reclaim their kingdom from the powerful Frost Giants. Unsurprisingly, Odd ends up the hero of the story, using brains over might in order to defeat the dreaded enemy. This month's Book Club pick was highly praised by its participants. Our third and fourth grade readers loved the plotting of the book, as well as the interactions between the main characters. They all felt that Odd would be a pretty cool friend to have. Harry liked the fact that the book was a fantasy. As he stated, "fantasies are a good show of your imagination." Essentially, if you have an imagination, you can do anything. Andreas learned a bunch of new words with this book, including "fjord" and "squall". And Cameron loved the way that Gaiman thought out the book as a whole. When I asked the group if there were any flaws in the book, Cam said "there were no waves, no ripples. The tide was flat." Nothing was wrong with this book! In one word, the book was "fantabulous"! November's Children's Book Club selection is Loser by Jerry Spinelli and December's selection is The Magician's Elephant by Kate DiCamillo. I look forward to seeing you all there!